I got this great package a couple days ago from Popdrome Service. 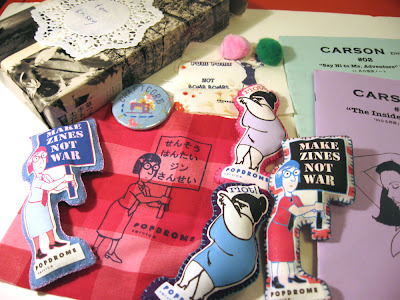 They are a collective of three zinesters making zines and crafts in Tokyo. The zines are all in Japanese. It is a shame I can't read them, but they look great! We did a trade because I totally fell in love with their little Riot Lady stuffie pins. I love the Make Zines Not War ones, too, of course. Everything I got is great and, of course, it was really fun to get a package from Japan! Oh wow, that little RIOT lady is rockin'!!! !